On Friday, renown physicist Stephen Hawking unveiled what has to be one of the most wonderful and terrifying clocks of all time. 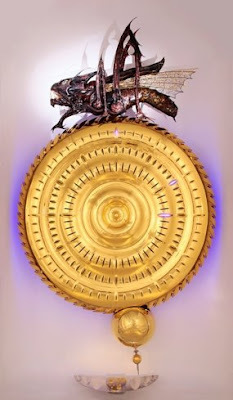 But the most remarkable feature of the clock is the killer grasshopper that sits atop it. Known as the Chronophage, it perpetually walks the perimeter of the clock. Every 59 seconds, it's mouth snaps open and shut as it "eats" the minute that's just passed. According to college officials, the clock has a few other features worth noting. For instance, at the top of every hour, it "reminds us of our mortality with the sound of a chain dropping into a wooden coffin. More playfully, the clock plays tricks on the observer, seeming occasionally to pause, run unevenly, and even go backwards." Read more here and see a video here. That's pretty awesome. It's brilliant-- it almost looks like a perpetual motion machine. Oh, and I almost forgot: I saw a billboard the other day with a rather large face of a pale girl with almost white hair. It seriously looked like Kiki except for the fact that her lips were crimson. It was even drawn in a similar style to the cover of the books and the illustration on the website. I would have taken a picture, but I was in a car on the other side of the highway and I didn't have a camera easily available. my dad told me about it when he was reading the newspaper! i didn't really get what he meant though. Wow. I think its sort of creepy. That is so awsome! The grasshopper is really creepy though. But I totally want that! Wow ananka! That's really cool. Do you mind if I post that on my blog too? Patsee: do you remember what the ad was for? UU: sure! Go right ahead. This is a little confusing but it sounds interesting. Doesn't "chronophage" mean "time-eater"? That's so creepy! I don't think the billboard actually said anything, but I could be mistaken. Oh, duh. I just realized that the name of the post is "The Time Eater". Silly me. that thing is so mesmerising. i could watch is for days. i think the gasshopper is cool and creepy at the same time. yay! i have never tried this before! (the open id thing) how helpful!